The Palazzetto Bru Zane opera issues can be divided into those which contain neglected works by composers who are still well-known (for example the recent issues of Gounod’s Cinq Mars and Saint-Saëns’ Proserpine) and those of forgotten operas by equally-forgotten composers (Joncière’s Dimitry and David’s Herculanum being of this sort). This present issue falls firmly into the latter category, though those whose memories go back a very long way or who collect old records will certainly know Godard as the composer of the ‘Berceuse from Jocelyn’ (the aria ‘Caché dans cette asile’) recorded by many pre-war singers. 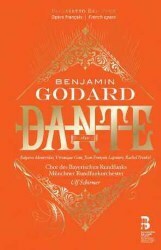 Even those who know of this morsel, however, are unlikely even to have heard of the composer’s Dante; certainly, the only recording of anything from it of which I know is the very brief duet “Nous allons partir” from the end of the opera recorded by Geraldine Farrar and Edmond Clément in 1913. A bizarre aspect of this issue is that although there is a 5-page essay on “Dante in nineteenth-century music” and a 10-page one on “Dante in the fine arts of the nineteenth-century” (both moderately interesting, but of little actual relevance to the opera), there is not much more than a single side of distinctly scrappy information at the start of the chapter analysing Dante about the composer’s life and works. Indeed, it took a considerable hunt in the book before I was able discover the composer’s dates; I finally found them at the top of the cast list on page 138! With a composer as forgotten as Godard, this is absurd. Most of the following information comes from Grove: Godard was born in Paris in 1849, and after some violin lessons with Vieuxtemps he entered the Paris Conservatoire aged 14. Like many nineteenth- century French composers, he competed in the Prix de Rome competition, failing to win it in 1866 and 1867. However, he had a huge success with a Symphonie dramatique entitled Le Tasse in 1878, after which he turned his attention to the composition of operas, beginning with Les Guelphes in 1880. Six more operas followed, the third being Dante, but most had little success. His last opera was the opéra-comique La vivandiere, but he died aged 45 before completing it and the orchestration was finished by Paul Vidal. This turned out to be a success and continued to be performed into the Twentieth Century. Godard was something of a reactionary in his musical tastes; his models were Beethoven, Mendelssohn and Schumann and he boasted of never having so much as opened a score by Wagner. During the1880s and 90s, Wagnerism was all the rage in Paris, so such views led to his being viewed with amused contempt by most critics. The composer whose music this opera most closely resembles is, to my ears, Gounod - another composer who was hardly a darling of the contemporary intelligentsia. The music of Dante is like that of most previous Palazzetto Bru Zane issues: very pleasant, tuneful and well-orchestrated, but lacking any genuine memorability. We go straight into the action with a dramatic choral fight scene between Guelfs and Ghibellines which does have some real drama, but Dante’s address to the crowd lacks any similar conviction. His solo scene after the conversation with Bardi, where he reflects on his hopeless love for Beatrice but then decides to speak to her about it, stubbornly refuses to stick in the memory, as does Beatrice’s aria in which she recalls how she and Dante grew up together. Bardi’s monologue at the start of Act 2 is better, but does not open out into real lyrical intensity in the way that it should. The duet in which Dante and Beatrice finally acknowledge their love for each other attempts passion, but doesn’t really deliver it. The orchestral Tarantelle which begins Act 3 is one of the most successful pieces in the score, as is a delightful scene for the Student in front of Virgil’s tomb which follows shortly after, but Dante’s dream relies on some rather obvious chromaticism to portray Hell. Act 4 contains two pleasant arias, one for Beatrice’s confidante Gemma and one for Beatrice herself, and the short ‘Nous allons partir’ duet is genuinely melodic, but the end of the opera lacks the sense of apotheosis that it should have. The singers are good without any being outstanding; if you would like to hear what the singing could be like try to find the 2-minute fragment with Farrar and Clément I mentioned in paragraph one. The Dante of Edgaras Montvidas is best in the quieter, more lyrical passages. The more heroic parts, such as Dante’s opening address in Act 1, are rather too heavy for him and there is a palpable sense of strain, but the succeeding ‘Le ciel est blue’ is nicely modulated, though even here some of the climactic high notes sound like hard work. At times, as in Act 2 scene 3, he needs to cover the voice more to avoid a throaty edge to the tone, but his French is good. Palazzetto Bru Zane’s resident soprano, Véronique Gens, sings Beatrice with the same qualities as always. The tone is pleasant if not really distinguished, though she always phrases musically. The words are better here than on some previous occasions, but there is still a lot more that could be done with them; they tend to disappear in lyrical phrases. Jean-François Lapointe’s Bardi is certainly adequate, but in all honesty not much more, as are Andrew Foster-Williams’ Virgil’s Shadow and Old Man and Diana Axentii’s Student. The orchestral and choral side of things is excellent, and Ulf Schirmer’s conducting conveys a sense of genuine belief in the work. The presentation is of its usual luxurious quality, but, as I have said already, a bit more thought about what would be genuinely useful and informative to the purchaser would be a good idea.